This shovel is great for moving loose garden material, sand, top soil, or debris. It can also be used to shape beds, mix concrete, level off areas that need to be flat or to scrape stubborn material off. Razor Back is the premier name in shovels. This round point is designed with the professional in mind. The heavy duty blade is combined with a dual-rivet, extended tab socket and steel/wood D-Grip to withstand repeated use in the toughest of conditions. Strength and durability make Razor-Back Tools the choice for professionals. 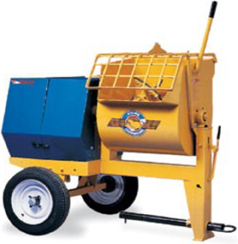 It is perfect for moving loose garden material, sand top soil, debris or mixing concrete. The Razor-back round point shovel is tough enough to dig in the hardest, rockiest soil. It features a heavy duty, open back, industrial gauge and steel blade. The open-back blade fits the premium 48-inch white ash handle. Perfect for transferring heavy, loose material. 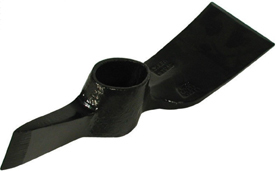 The solid shank construction features a flat blade designed for moving asphalt. It also features a 27-inch ash handle with armor D-grip for hand comfort and control while lifting heavy material. The wide, flat blade on this sturdy scoop is perfect for prying up and removing asphalt shingles and roll roofing. A roofer's scoop is also a useful and versatile garden tool. 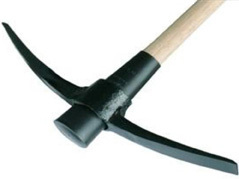 This shovel is ideal for transferring loose material such as a coal, stone, and gravel. The tool features a tempered steel blade, 21- inch lift, and 27-inch handle with armor D-grip. Great for heavy duty applications. This sturdy steel shovel is great, all-purpose tool and an essential part of any tool assortment. 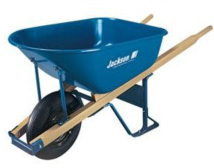 It's perfect for moving loose material such as sand or top soil. This furnace scoop is more versatile then its name implies. 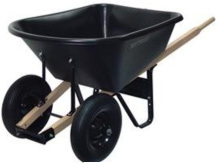 It's sturdy enough for scooping and moving coal and ash but it can also be used for general clean-up. shaping beds and leveling off areas. The Jackson line is designed for professionals who expect high-quality features and durability. This sturdy coal shovel can be used to scoop and transport heavy duty materials such as coal, mud, ash and stone. Heavy duty steel trays, professional grade steel undercarriages and strong hardwood handles. The Manhole Cover Bar is made from hexagon high grade steel with a hardened steel diamond point. This 24-inch long, 3.75 pound steel prevents bending. This tool can be utilized for prying loose conventional manhole covers. The San Angelo Digging Bar is used for digging and prying of dirt and large rocks. Manufactured from tempered steel for maximum strength and durability. At 17lbs. and 72 inch overall length. This pinch point crow bar is a 60" long straight forged steel bar with a round tapered handle. This long hand tool is utilized to pry and lever objects. The typical use for a 18 pound crow bar include breaking up clay, concrete and other hard materials. The Wedge Point Crow Bar is 66 inches long forged steel shaft for maximum strength. This tool is used to pry and lever heavy objects with its wedge tip point. Typical uses for a 25 pound crowbar included breaking up clay, concrete and other hard material. 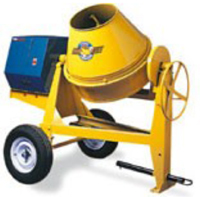 All-purpose accessory for general demolition work in concrete, asphalt and other materials. Asphalt cutter hex shank is made specific for asphalt and should not be used on concrete. The 3-pound Hand Drill Hammer with hickory handle. Used with chisels, punches and hardened nails. Their design permits heavy blows with limited swing. Traditional hickory handle won't splinter for years to come. 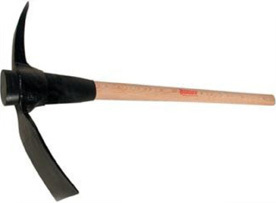 The 10-pound double faced sledge hammer features a 36-inch hickory handle. The hammer is used for general sledging operations in striking wood, concrete, metal and stone. Traditional hickory will not splinter and will last for years to come. The 20-pound double faced sledge hammer features a 36-inch hickory handle. The hammer is used for general sledging operations in striking wood, concrete, metal and stone. Traditional hickory handle will not splinter. This pick handle is for replacement of any of our Mattocks. Durable Rail pick for multi-use with one side chisel and the other pick. Great for breaking up rocky soil. Multi-use tool one side bladed or chisel. Double sided multi tool has a hoe blade on one side and a end pick on the other. 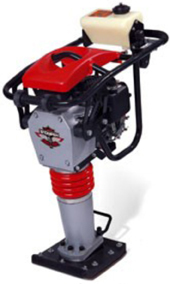 Tampers are used to compact dirt or asphalt and other materials. 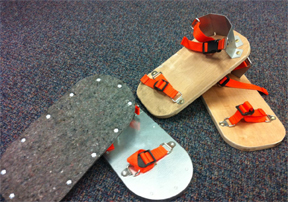 Always in stock and available asphalt shoes are durable and well-crafted shoe for the paving industries. Solid nylon straps and plastic quick snap buckles. White braded line 125' for marking areas with ease. This asphalt Lute is used to level and smooth asphalt. All parts are sold separately or assembled. When ordering indicate your part number to your specific item needed. This asphalt Lute is used to level and spread. This bow rake is perfect for loosening or breaking up compacted soil, spreading mulch, raking leaves. This Aluminum rake is designed with a wide head to level quickly and smoothly. This rake is ideal for large yards, quickly and efficiently collect leaves. Professional grade. Perfect for leave collect. This spring brace rake is like no other. 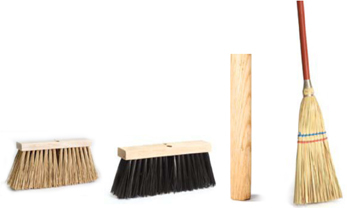 6 cubic rugged construction for sweeping heavy debris under dry or wet conditions. 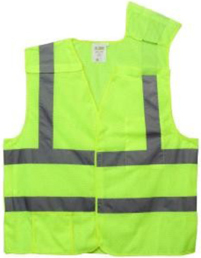 This safety vest is perfect for construction 4 pockets, two on chest area with Velcro close and two on the inside also with Velcro close. Made of breathable mesh fabric with 2Ã¢Â€Â� silver reflective tape. Our most popular glasses are the Ztec economical safety glasses. A fast drying permanent marking paint applied in an inverted position that is lead free and V.O.C. compliant. May be actuated by hand or may be used with marking wand or gun. While it has a water base formulation, it will not wash away. Suggested Uses: Utility Marking, Golf Course, Landscaping, Construction Sites, Surveying, Mining, Sports fields. 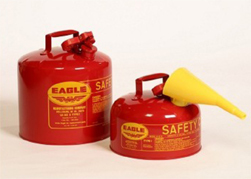 These Eagle Safety Products meet OSHA requirements NFPA 30 requirements and UL and ULC listed and FM approved for safe handling and storage of gasoline. Eagle Safety Containers are manufactured from 24 gauge hot dipped galvanized steel other manufacturers may use lead coated steel. Available in four different sizes. Yellow can also available for Diesel fuel, funnel also included! 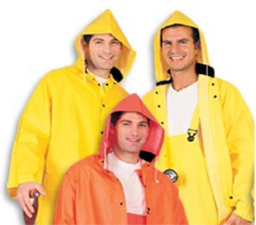 35 mm 3 piece 2 PLY P.V.C heavy duty rain suit with super strong polyester lining. Features electronically welded seams, take up plastic snaps on sleeves and ankles, and a soft lining for extra comfort. It also has a detachable roomy drawstrings hood and a ventilated cape back for extra comfort, two flapped pockets, bib style trousers with snap fly. Nonconductive suspenders and buckles. Durable 17" rubber overshoe slush boots are constructed of cotton lined yellow rubber with a black cleated outsole to reduce slippage. Boots features a top strap and buckle for easy on comfort fit. These boots are ideal for applications requiring heavy-duty protection. These boots are 100% waterproof and excellent for moderate chemical resistance, construction and concrete work and general wet applications. Non Conductive. Customers should order their shoe size when selecting an overshoe boot. The silt fence with 11 stakes, 1 every 10 feet, is specially designed to allow water pass through while retaining silt. It protects streams, lakes and other waterways from silt build up and keeps roadways free of mud. It is durable, strong, lightweight and easy to use 3' x 100'. Lightweight and flexible fence, that is used for safety at construction sites, ski slopes, etc. is east to handle, install or relocate. It is U.V. inhibited and resistant to temperature changes. Size 4' x 100'. 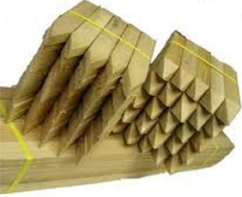 These durable grade stakes are available by the individual piece, pack of 50 or larger quantities. Cowhide leather Palm Gloves, two styles available, comfortable and durable gloves for hand protection under the toughest conditions. Rubber cuffs offer more protection. HI-VIZ Fluorescent red/orange vinyl coated nylon flag 18" x 8" mounted on 3/4 diameter hardwood dowel. Hem may be sewn or heat sealed. All Vinyl constructions assures flexible yet rugged durability. It's high visibility provides the user with the ultimate conversion of light with brilliant fluorescence. It meets MUTCD specifications and is sensibly priced to accommodate your budget. Repeat wording easily identifies hazard. Poly barricade tape in jumbo rolls, strong, yet disposable and very economical. Available in yellow with black print. 3" X 1000' rolls. Adjustable sizing for best comfortable fit. These Hard Hats are designed to protect the head from falling objects complete with attachments slots for ear muffs or face shield. Easy to use and light weight. ANSI Compliant. Performance, precision and power in a super-rugged, quality-engineered static ride -on roller. 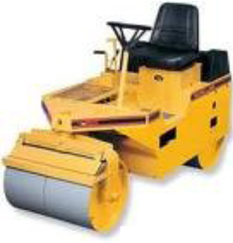 The stone WolfPac 2500 1 1/4 ton static roller delivers years of reliable service. 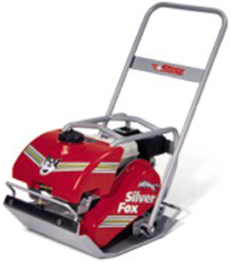 Ideal for applications including driveways, parking lots, landscaping, pot hole repair and paving jobs. Deluxe Mid-Range 6 Cu. Ft. 1 1/2 bag capacity—high dump mixer. Extra capacity for up to a full 6 cu. ft. batch; 4.80 x 12 (20Ã¢Â€Â� dia) high speed tires, tapered roller bearings, 46Ã¢Â€Â� wide axle, retractable 2-3/8" O.D., 7/32" think tow pole, pintle style hitch, 24" dia. Hand wheel discharge, long life drive hears and dump lock. Spacious cowls with maximum ventilation. Big 30" diameter thick steel drum. This middleweight 4 cycle Stomper® model XH730 combines optimum impact with an easy to manage weight for a great all-purpose rammer. Equipped with 4-cycle 4 hp Honda engine design specifically for rammer applications this model has an impact force of 3,100 lbs. weighing in at only 144lbs. And using such precision components as a two-stage air filtration system, forged pistons and solid snubbers, these stoppers are built to last. Combine the Xh730's internal components, engine, weight, operator friendly features, and a leading-edge design and you have a rammer that is smooth running, easy-to-operate, and designed to take a beating and keep on running. The XH730 is one of three models of 4 cycle rammers that we have to offer. Superior compaction in any direction great for sand grave and mixed soils. Fully hydrostatic, variable speed range allows for faster compacting and great maneuverability and control. Forward and reverse on the spot. Patented one-piece base plate design includes extra-large oil reservoir that dissipates the internal heat to the entire plate surface. Cools the oil inside and preheats the base plate for more efficient performance on asphalt. Synchronized drive system requires only one belt for efficient power transfer. Exclusive eccentric housing is an integrated part of the base plate, so vibration is more effectively transferred to the ground. Since the eccentric is mounted forward of the engine, forward plates deliver faster travel speeds, higher amplitudes and increased climb ability. 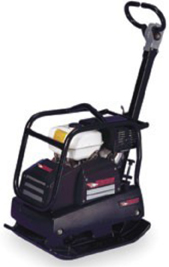 Ideal for small asphalt jobs travels up to 100ft/ min. All Purpose combo blades are great for cutting almost anything such as, green concrete, block, brick, clay pavers, hard brick, refractory brick, field stone, marble, granite and walk behinds up to 20 hp. Available in 14" blades. The Husqvarna K 1260 is the market's most powerful cutter, with an impressive 5.8 kW (7.8 hp) output. Featuring the new generation Active Air Filtration™, one of the market's most efficient centrifugal air cleaning systems that delivers up to one year's operation without a filter change as well as a highly efficient vibration dampening system. The K 1260 is ideal for heavier cutting of concrete and stone in alterations, renovations and new construction. It is perfect for cutting smaller holes outdoors and adjusting window and door openings, as well as for pipe, asphalt and metal cutting. Manual pull up tank closure with adjustable abrasive flow valve. 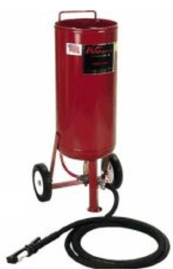 Pressure relief flow valve-125 PSI pressure gauge, blast hose, tank volume 2.5 Cu Ft, wheels 10" approx capacity is 250 lbs, 1-2 hours blasting time. Home | Contact Us | About Us | Product List | Supplies Copyright© Malcolm G. Stevens, Inc.